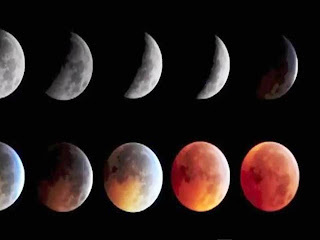 The last and the longest total lunar eclipse ( Chandra Grahan) of 2011 will be on December 10th and it will be visible in India, Dubai, Qatar, Oman, Bahrain, Saudi Arabia, Nepal, Sri Lanka, Singapore, Malaysia, Australia and United States. Central and eastern Asia is where the eclipse can be best viewed and photographed. People on the west coast of the United States and Canada will see the beginning of totality just as the moon disappears below the western horizon. Viewers on the east coast will not see the start of the umbral eclipse before moonset. The eclipse’s total phase lasts for 51 minutes. It starts at at 11:33:36 Universal Time (UT), with totality starting at 14:06:16 UT. The point of the greatest eclipse occurs at 14:31:49 UT. The umbral eclipse magnitude will reach 1.11 at this point. Totality ends at 14:57:24 UT, and the entire eclipse finally ends at 17:29:57 UT.